Sam Feldt has been at the forefront of the tropical house movement since the genre’s inception back in 2013. 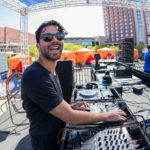 With a knack for glowing melodies and beats-of-paradise, the Dutch producer has stuck to his mantra of creating mellow, poolside offerings instead of the main stage-ready sounds many of his fellow countrymen have embraced in the past. Ahead of Palm Springs’ Splash House festival, Sam Feldt takes Dancing Astronaut‘s listeners through a short but sweet trove of tropical treasures he will be spinning at the event and throughout the summer. Opening with his new collaboration “Fade Away” with Lush & Simon, Feldt taps Spinnin‘ colleagues LVNDSCAPE and Redondo for two of the nine cuts in the mix along with sunny favorites from Autograf and Tom Budin. Listen to the full minimix below exclusively on Dancing Astronaut’s Mixes page.